Elegant yet unhurried, the city of Arezzo brings together the best of old and new Tuscany with an easy-going lifestyle and fewer tourists than you’d expect in a culturally-rich and attractive city. It’s hard not to draw parallels to Florence as you walk around Arezzo. The pleasant pastel and stone buildings along cobbled lanes blend many similar Medieval and Renaissance styles as the more famous art city that is just about an hour away. 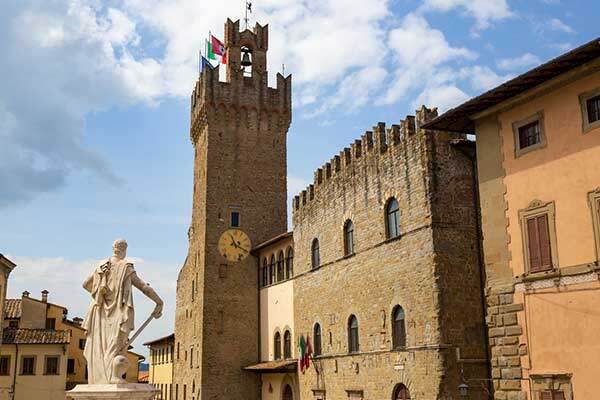 Arezzo also fell under the realm of the Medici’s grand duchy for a time, and shades of Florence abound in its public buildings, aristocratic palaces, churches, and artwork. Ground-breaking artwork by Renaissance masters are scattered in museums and churches all around Arezzo. With just under 100,000 people, it’s a good size to offer everything you want while still being manageable and personable. Even better, it doesn’t have the millions of tourists traipsing through its streets every year like Florence. The historic center is the dazzling drawing room of Arezzo, still partially enclosed by protective walls with its monumental gates intact. At the summit of town, the ruins of the Medici fortress survey the panoramas of picturesque Tuscan countryside awash with olive groves and vineyards. The lower, newer town has its charms and services, keeping the city from stalling in the Middle Ages and making Arezzo both modern and historic—a fine mix for everyday life. With a beautiful ambiance, a rich cultural line-up, and events throughout the year, Arezzo makes a perfect retirement destination. Arezzo is at the eastern point of a triangle formed with Siena and Florence, with the dreamy Tuscan countryside sprinkled with fairytale towns in the middle. In fact, it’s at the eastern fringe of the Chianti wine zone, and the Val di Chiana valley where Arezzo produces notable wines as well as the famed Tuscan beef known as Chianina, for those decadent thick Fiorentina steaks. 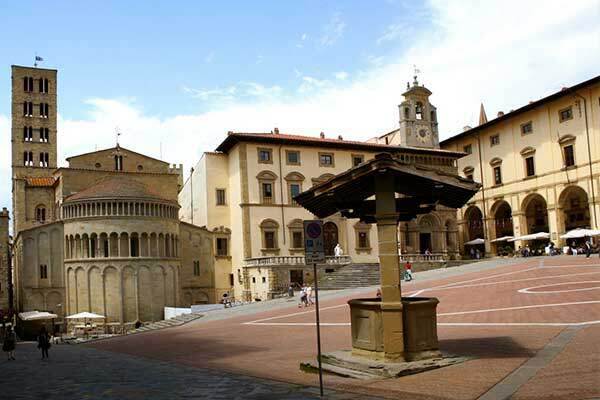 The University of Arezzo lends a sense of youth and vitality to the city. Arezzo also has good rail and bus connections to surrounding cities and smaller towns. Equidistant between Florence and Perugia airports, about an hour away by car or rail, or Siena, also an hour away by car or bus, giving Arezzo great options for an active cultural life. The climate here is like most of Tuscany’s with relatively hot summers and chilly, damp winters. July and August can see temperatures around 90 F during the day, but evenings cool down for relief, and winter highs tend to be in the low 40s F with colder nights. Rainy season is from October through February, and the city is the occasional recipient of some snowfall. Italy has one of the best healthcare systems in the world, ranked number two by the World Health Organization, and Arezzo has an array of medical options available. There are public and private hospitals and medical clinics in Arezzo, and other smaller hospitals scattered around the province for additional options. Life truly is beautiful in Arezzo, and it’s easy to see why Roberto Benigni used his hometown as the set of his Oscar-winning film Life is Beautiful. The sloping Piazza Grande is the central gathering spot that everyone passes through. It is the location for a rousing horse race, sort of like Siena’s Palio, but with lances, held twice a year. The piazza is also the scene of a monthly antique market that draws people from around Italy for the 500 stalls and festival-like atmosphere. Museums filled with art by Tuscan and Italian masters, archeology-dedicated museums, and edgy contemporary art galleries are to be found around town, along with churches and public buildings bearing breathtaking works, open for viewing. The Teatro Petrarch opened in 1833 and still puts on a full calendar of shows, musicals, classical concerts, and operas within its horseshoe-shaped auditorium, outlined with ordered rows of opera boxes, while the Mecenate Theater hosts modern and experimental dance and prose. There are multiplex cinemas, plenty of bars and cafes, and loads of dining options ranging from simple trattorias to Michelin-ranked restaurants, and everything in between. City parks offer green space and the forested foothills of the Apennine Mountains start just outside of the city. Arezzo sits close to the Umbria and Le Marche borders, making it easy to launch off for explorative day trips around the area. And connections are great for getting further afield around Italy and Europe, too. For all its quality of life and location, the surprise is that Arezzo isn’t more “discovered” and higher priced. Being at the eastern fringe of Tuscany, it has stayed off many radars, providing one of Tuscany’s real gems. Overall, prices in Arezzo don’t leave you gasping for breath despite being in usually costly Tuscany. In fact, you can find a spacious two-bedroom apartment close to everything for less than $110,000. A restored one-bedroom home with classic Tuscan touches like terra cotta floors and wood beam ceilings in the old town can be found for under $100,000. Prices in the city center will go from there up to more than a million, with the average price per square foot running $178. The average rental price in the city center is $624 per month. Country farmhouses close to the city can be found for close to $500,000. 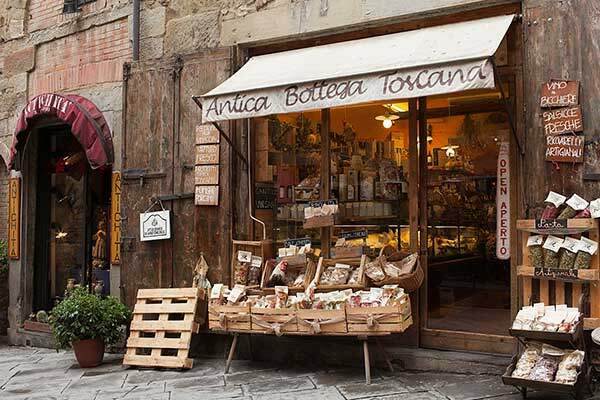 Arezzo’s cost of living is in line with the rest of Italy in terms of general prices for everyday goods and services. Enjoy a glass of wine aperitivo with snacks buffet for $8 in most of the wine bars and piazza cafes around town. A plate of handmade pasta with a glass of wine will cost you $14.78 at a trattoria, while an upscale meal in an elegant restaurant will run about €130 for two people. A cappuccino in your neighborhood coffee bar will cost about $1.50 while at the historic Caffe dei Costanti founded in 1804, you’ll pay $4, but it has historic ambiance so it’s worth the extra money. You can see a show in the historic Teatro Petrarca, for $11.37, season tickets are typically $96 to $290 for the best seats. A movie costs $8. Hop a train to Florence for $19.40; to and from Perugia will cost $17. A bus ticket around town is $1.69 while a monthly pass is $39. Utilities will cost in the same average as the rest of Tuscany—figure about $185 a month to cover electricity, heat, and water.